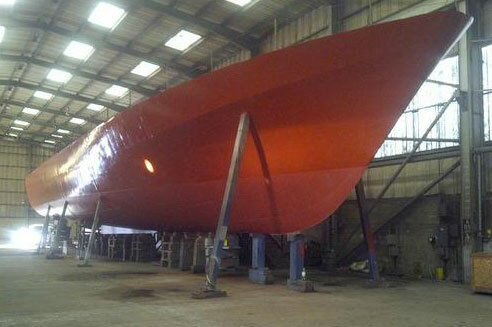 A 42-metre superyacht hull has been listed for sale on eBay for £60,000. The steel hull is advertised as completed up to, and including, the main deck, and being classed to Lloyd’s 100A1. The advert claims that £1million has been spent on the project so far. SuperYacht World was told this morning that the build has been abandoned because the owner has run out of money to finish the project and no longer has a need for the yacht. The hull originated at Brooke Marine in Lowestoft. The current owner moved the hull from its shed and made it watertight, but it has never been on the water. The hull, including engine beds, all bulkheads, fuel and freshwater tanks and ballast tanks, will be sold with the completed plans. It is sitting on the hard in Lowestoft, on the UK’s East Coast.